The Mars Generation » Blog » Train Like A Martian » 2018 #TrainLikeAMartian Day 1 Challenge: Mission: Control! This year we have a few different challenges to participate in for added fun! Every day during the challenge we will post (both on our blog and on our social media channels) the #TrainLikeAMartian fitness challenge, a STEAM (Science, Technology, Engineering, Arts and Math) activity and a bio-hack challenge. You can participate in any or all of the challenges. Join us today and let’s all have some fun and be entered for a chance to win prizes too! Remember for every $25 donated, donor gets one entry in the daily prize drawing for #TrainLikeAMartian! Please make a donation today to help us reach our fundraising goal of $10,000. To kick off the #TrainLikeAMartian Challenge we are starting with NASA’s Mission: Control! Exercises from their Train Like An Astronaut program*. 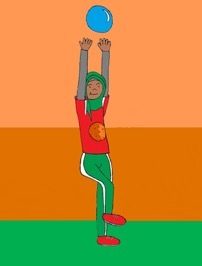 This activity requires you to throw and catch objects on one foot to improve your balance and spatial awareness. See how long you can balance! Want some instruction on how to complete this fitness challenge? Watch the video here or Click here for awesome NASA* resources for this activity. 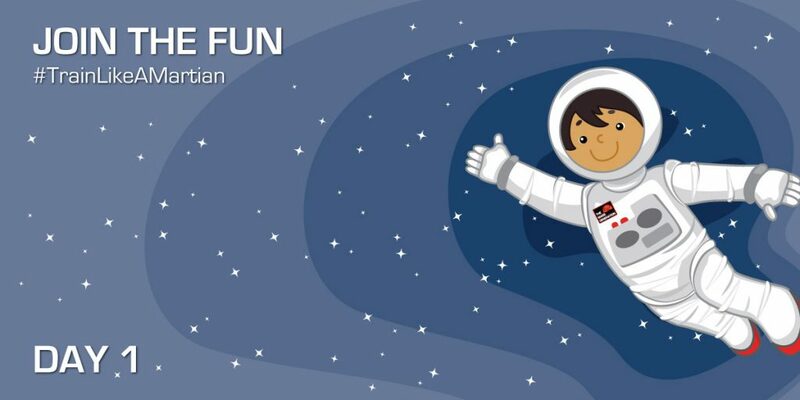 Resources include a detailed educational guides for teachers, including adaptations for all of their Train Like An Astronaut program activities. Our first STEAM (science, technology, education, arts, math) challenge is to perform a water refraction experiment. See if the size of the water jar makes a difference on how the image is refracted. Want some instructions for how to perform a water refraction experiment? Click here for instructions. Drink 64 oz of water today. Whether you’re living on Earth or Mars, hydration is very important for a healthy body. Dehydration can lead to disorientation, fatigue, muscle cramps, fever and more. These are all things that could not only jeopardize your own well-being but the success of an astronaut’s mission. For today’s biohack, try to skip soda or coffee all day as they can lead to dehydration when consumed in large quantities. Shoot for drinking 64 oz of water instead. You can even try adding apple cider vinegar or a slice of lemon to your filtered water. Our Train Like A Martian Challenge runs for 5 days from May 14 – May 18, 2018. Every day we will post a new fitness, STEAM and bio-hack challenge on our social media channels right here on our blog and on our social media channels. Complete the challenge activities or any physical activity and share photos on Twitter, Facebook, Instagram using our event hashtag #TrainLikeAMartian to be entered in our daily prize drawings. Find out about the cool rewards you can earn through fundraising for The Mars Generation by clicking here.